Halloween crafts for kids are EVERYWHERE right now. And I get it. Halloween is definitely my favorite holiday. I love the smell of toasted pumpkins and the chilly night air with a blustery wind. Throw on a good classic horror film like Bela Lugosi in Dracula and we are all set for the night! 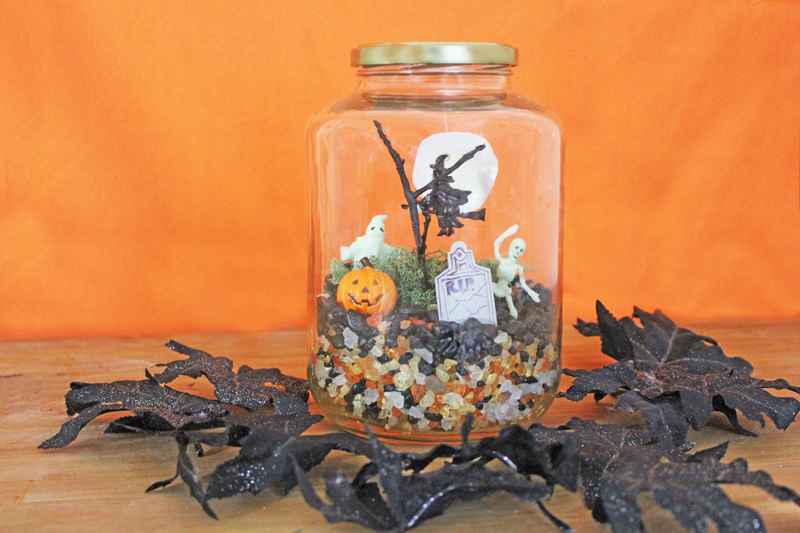 But I digress….clearly I love a good Halloween craft that stirs the imagination, so what better way to celebrate than by making a Halloween themed terrarium AKA Terror-riaum? Typically I share all the steps in a visual tutorial but this project was originally developed for a print publication with a limited number of images. I trust that you all are capable of following written instructions! Step 1 Color your rock salt * See below for a how-to. Step 2 Paint your stick black, let dry. Step 3 Make the stars and moon. 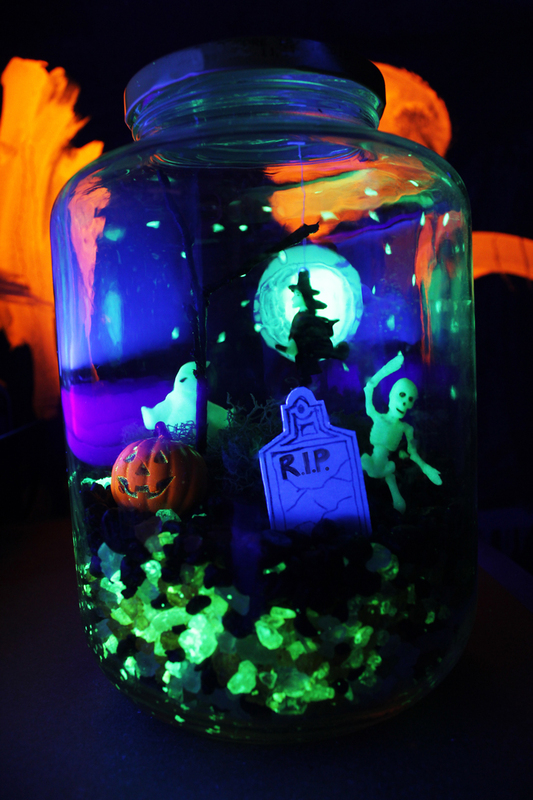 Paint dots on the outside of the upper half of your jar using glow in the dark paint. Paint one large circle for the moon. Let dry. Step 4 Make gravestone: Cut out a gravestone shaped piece of gray cardstock. Print “R.I.P” on the upper portion and decorate gravestone with hand drawn details. Step 5 Add the colored rock salt and a ½ cup of uncolored rock salt to the jar along with a ¼ cup of black gravel. Stir or shake to mix. Step 6 Add another ¼ cup of black gravel on top. Sprinkle a few pieces of glow in the dark and orange salt on top of the gravel. 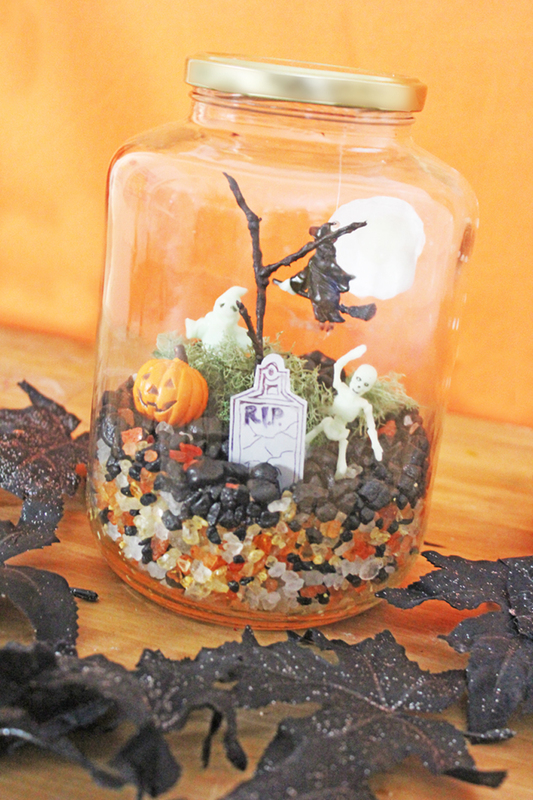 Step 7 Add Halloween figurines , moss, and gravestone to your jar, pushing the figurines down into the gravel/salt to position them. When finished add your black stick. Step 8 Cut a piece of thread to an appropriate size to hang the witch or bat. Hot glue the thread to the top of the witch/bat, then glue the other end of the thread to the underside of the jar lid. Screw on the lid. Step 9 Charge your terror-raium by letting it sit near a light for an hour. For the best glow in the dark effect, use a backlight near the terror-aruim. Turn out all other lights and be prepared to be spooked! To make glow in the dark rock salt: Place a ½ cup of salt in a Ziploc bag, add 1 oz. of glow in the dark paint to bag. Seal. Now mix the sand and paint together in the bag, squishing it between your hands until fully mixed. Let dry. To make orange rock salt: Place a ½ cup of salt in a Ziploc bag, add several drops of red and yellow food coloring to the bag. Repeat sealing and mixing process as per instructions above. Cedric Gibbons. Cedric Gibbons was an art director for MGM studios for 32 years and oversaw the production design of many classic films including The Wizard of Oz, The Merry Widow, and An American in Paris. Making this terror-arium made me think of production design and one of the most memorable and creepy sets of all time, the witch and her castle from The Wizard of Oz. Though many people worked on the set, make-up, and costume design for the film I chose to highlight Mr. Gibbons since he was the senior art director for the movie. Art Direction and Production Design is often overlooked when accolades for filmmaking come out but I personally believe it is one of the most important aspects of a good movie. The tone of a film is entirely set by the physical scene around the actors. Sometimes in the digital era I miss those good old fashioned SETS, with amazing props and details that make the film believable and memorable. If you enjoyed this Halloween Craft for kids be sure to visit Pollock Pumpkins where Halloween meets high art! And don’t miss out on more holiday fun here on Babble Dabble Do! Your child’s inner Cedric Gibbons thanks you! Subscribe below or like us on FB! Pretty genius play on words and such a fun activity/decor idea! tricia recently posted…Duck Tape Pumpkins! That Jar looks great i like how it look in the dark at knight…. my kids are going to love this activity. What a fun way to get them involved in Halloween decorating! When you say “giant pickle jar” – what size jar is that? Can you give feedback on quart, 1/2gallon or size measurements like 6″ tall by 4″ wide? Giant pickle jar that holds full size dill pickles or giant pickle jar you’d buy at the grocery store? Cant wait to make this as a class craft with glow-in-the-dark zombies!